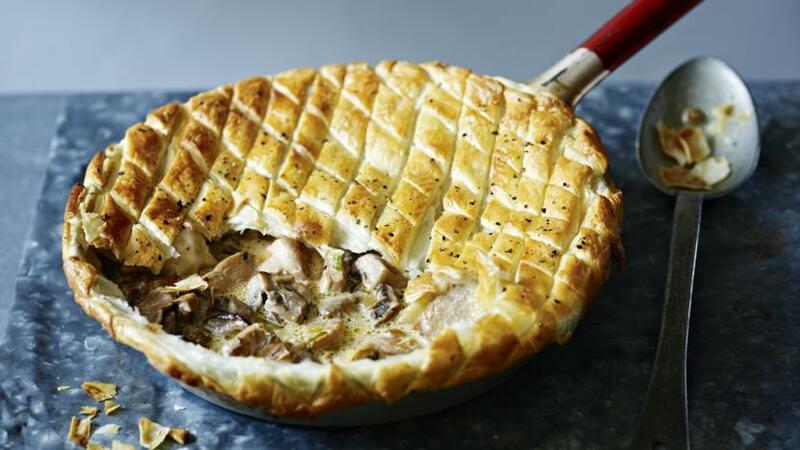 James gives the traditional chicken and mushroom pie a special twist with wonderful wild mushrooms and Madeira. Save on the washing up by baking in the pan used to make the filling or simply bake it in a pie dish. Serve with sautéed greens for a wonderful supper. Equipment: you will need an ovenproof frying pan for this recipe. For the rough puff pastry, place the flour in a mound on a clean work surface and make a well in the centre. 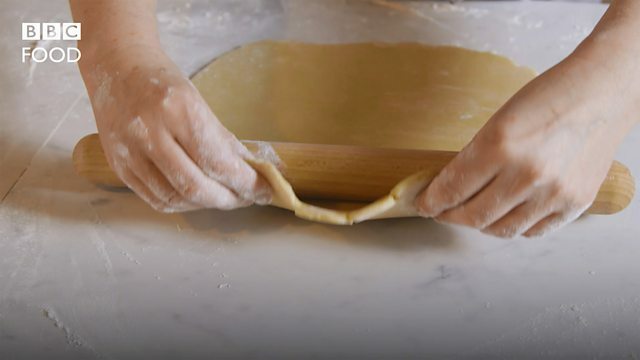 Place the butter and salt in the well and work them together with the fingertips of one hand, gradually drawing the flour into the centre with the other hand. When the cubes of butter have become small pieces and the dough is grainy, gradually add the iced water and mix until it is all incorporated, but don’t overwork the dough – you should have a marbled effect with the butter without mixing it in completely. Heat a large ovenproof frying pan until hot, add the butter and when the butter is foaming, add, the shallot and garlic and fry for a minute. Add the chicken and fry until just coloured. Add the chicken stock and bring to a simmer, then add the tarragon and cream and simmer for five minutes. Add salt and pepper to taste and then set aside to cool.